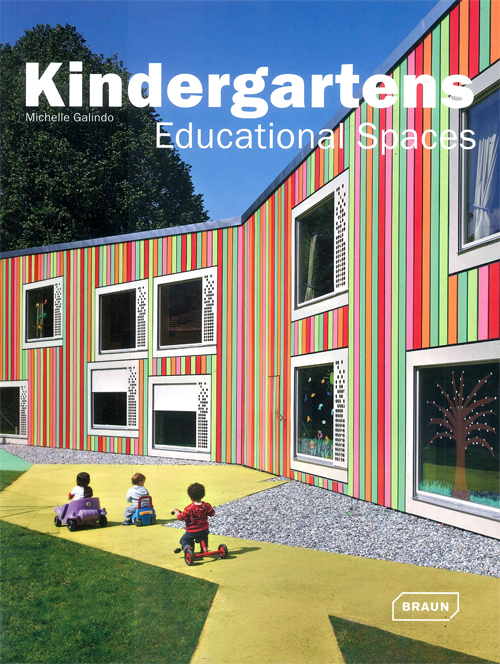 Kindergartens: Educational Spaces by Michelle Galindo showcases 60 contemporary architecturally designed early learning centres from around the world - celebrating fun, learning and creativity. The book whilst does not delve deeply into the architectural decisions and repercussions offers a selection of beautiful images - providing inspiration and the variety of approaches according to the site and pedagogical context. This design was inspired by watching children and the time they spent on the ground - lying, sitting...as well as the time they spent looking up. Therefore, the architects deduced the importance of both planes - using different colours to differentiate the different spaces, and shafts of coloured light in the roof giving different moving light experiences throughout the day. This project takes the idea of permeability between the exterior and interior. Configured as two crossing axes, one with public activities and administration and the other, the teaching activities and 'home' rooms. All spaces receive natural light and ventilation. 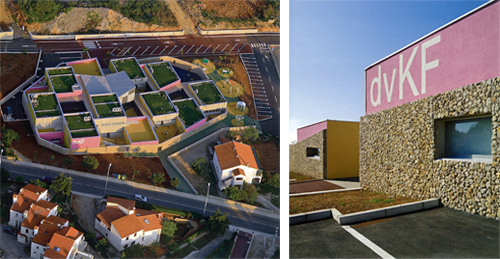 Located in an area of residential growth the kindergarten is the first phase of an education facility - kindergarten, dining hall/gymnasium and primary - are arranged in a u-shape. The design is based on children's perceptions - taking into consideration children's scale as well as the idea of different spatial experiences - through the use of space, light, materiality and colour. Situated within a shopping mall - this centre is based on the theme of "animals in the savanna" - like monkeys, the children have to interact with the centre's landscape where they can cross a ball pool, climb a climbing wall, cross a crocodile pit by a rope bridge to a climbing net and finally get to the safe gallery...and a children's theatre, puppet shop, doll's house and reading area set among a 'nest in the treetops'. The nursery is part of the GlaxoSmithKline company campus - offering day care for the 1500 workers' children. 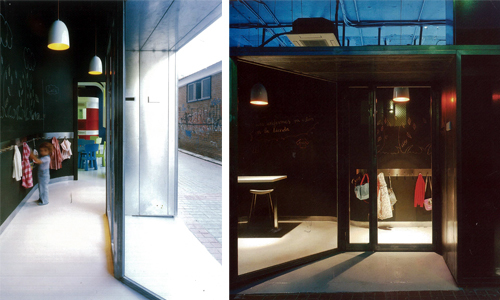 The centre was to create a domestic space amidst a semi-urban area characterised by industrial buildings and warehouses. 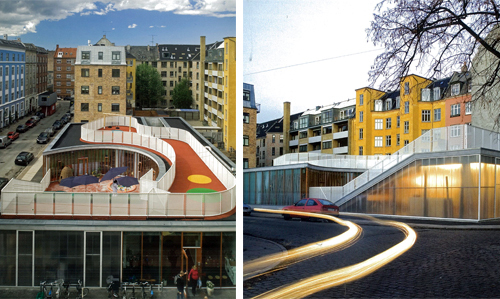 The building is arranged around a elongated courtyard, creating a protected playground space. The various components were produced in the factory, preassembled and mounted on site. 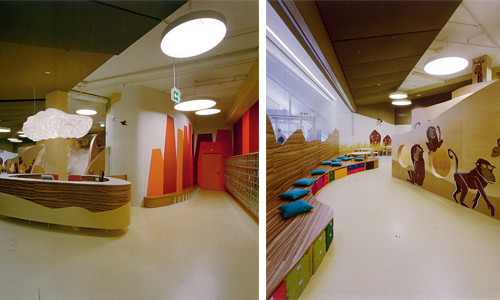 The project is similar to that of the early modernists' functional kindergarten and school designs. This building is arranged as a square within a larger, circular enclosure made up of double circular walls. Open to the sky, four courtyards are created suggesting the four elements: air, earth, fire and water. The space between the perimeter walls serves as a "secret" place for the children. The design of this centre was driven by again the contextual surroundings - it was to fit snug within the site and provide comfortable and protected spaces for the children - with a constant connection to the outdoors. 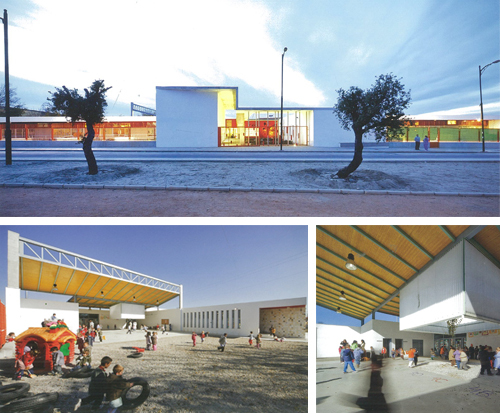 Educating children with physical or developmental handicaps, the kindergarten uses four simple modules of territories defined by colours, radiating out from a shared atrium. Repetitive framing allowed for factory production of large modular panels. 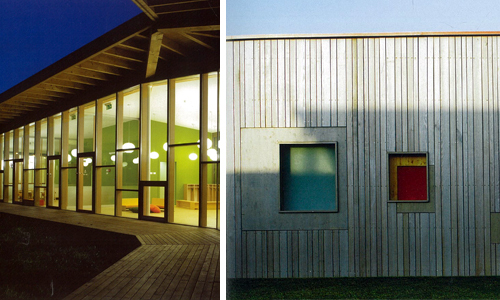 'A house for children' - this modest centre integrates itself with the region's context and provides a relaxing space for the children with the interior made entirely from natural wood - pine and ash. The furniture was also made by local carpenters. The design for this centre works to create a connection with the surrounding context - building character and environmental. 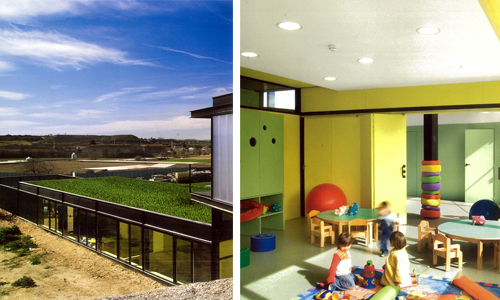 The building's orientation utilises the best possible sun exposure and penetration, whilst the roof space extends the opportunity for outdoor play. With three 'home areas' the building is shaped like a an organic, living entity poised in a sheltered embrace - with windows placed haphazardly - yet with the light tunnels allows light to fill the interior spaces. 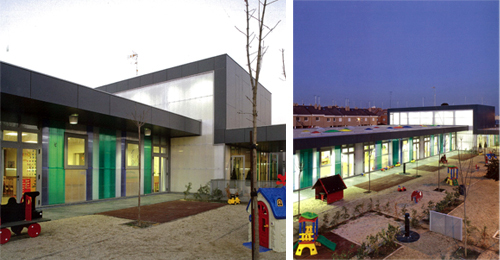 This new early learning centre was built using low-energy principles - wood construction, insulated components, south orientation, a controlled heat and ventilation system and photovoltaic panels - where the current supply of energy is displayed to the children on an information board - making the children aware of the issue of renewable energy.